Posters with happy grape mascots are for VIPs only. 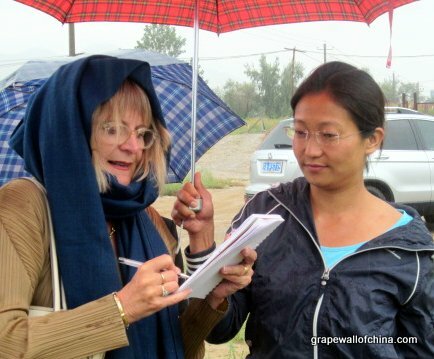 Fans of UK wine critic Jancis Robinson might well have seen her four posts about a recent trip to the Ningxia region in China. The “free for all” section included one titled “China’s most promising wine region?” while paid subscribers could read her overview of Ningxia, outline of ~20 of its wineries and notes on more than 50 local wines. She also recently wrote a column about Ningxia for the Financial Times (see Châteaux China) and a post about a Changyu wine from Ningxia now available in retail in London (see here). 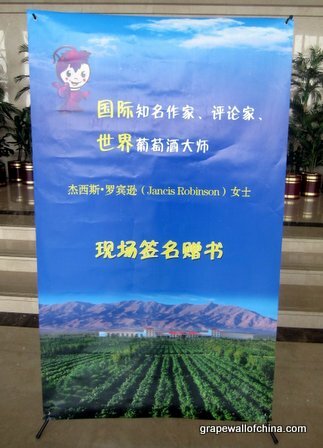 This was not only the first time Robinson visited Ningxia but also the first time Ningxia hosted such a high-profile critic. 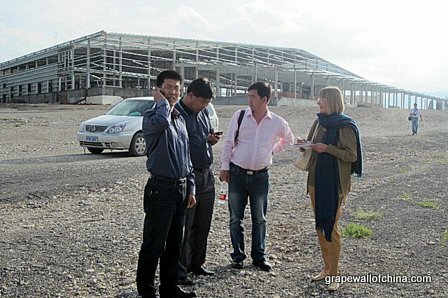 As well as tasting 39 wines for the Ningxia Wine Awards, Robinson spent a day touring vineyards and wineries, from those with more than a decade in the business to those with facilities under construction and yet-to-be-planted fields, part of a plan to increase coverage by ~60,000 hectares. Robinson considered this to be the best of the four flights of red wines. In the Financial Times, Robinson wrote that, among the 39 wines, she found “five that qualified as excellent, and only six that were less than commercially acceptable”, the latter due “to the very easily remedied fault of oxidation”. Robinson joined a barrel tasting at Helan Qing Xue with (clockwise, far left) chief consultant Li Demei, vineyard head Wong, general manager Rong Jian and winemaker Zhang Jing. A version of the winery’s Jia Bei Lan 2009, which won a Decanter international trophy last year, scored highest among the reds at the Ningxia Wine Awards. Robinson takes notes in the rain while talking to winemaker Emma Gao of family-owned Silver Heights. 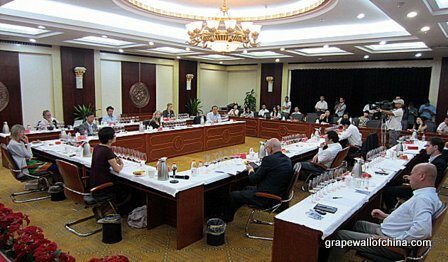 Robinson also tasted at Gao’s winery and gave the “Emma’s Reserve” 17 points out of 20, the same as the highest score in the Ningxia Wine Awards. 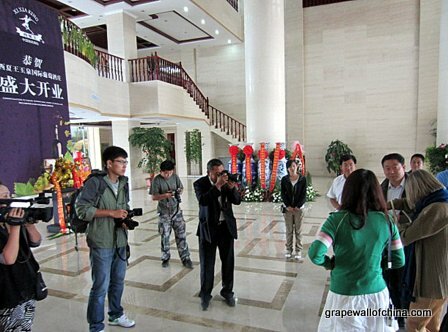 There was no shortage of photographers when Robinson arrived at the new headquarters of Xi Xia King, the oldest wine operation in Ningxia. Xi Xia King winemaker Yu Hui Ming received the highest score for a white wine at the Ningxia Wine Awards. 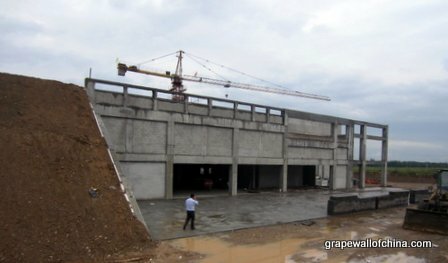 Moet Hennessy’s Chandon operation is slated for completion in 2013 although management plans to buy grapes and produce a sparkling wine this year. Look for Chandon to make wine from its own vineyards starting in 2015. 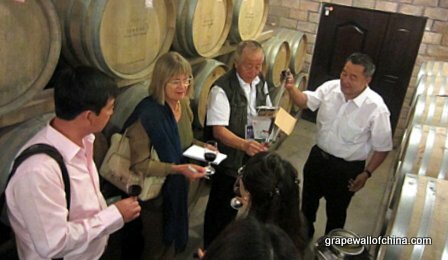 Li Demei, who has consulted for wineries across China, served as the guide during the Ningxia winery tour. Here he examines a vine and explains local viticulture practices to Robinson. 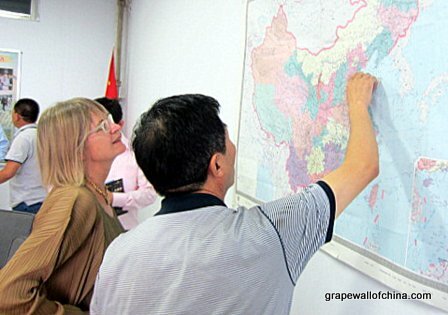 Guangxia GM Lu Da Jing shows China’s wine regions to Robinson at the winery where Pernod Ricard produces its Helan Mountain brand. Winemaker Craig Grafton and Brett Richardson later led a tasting of four Helan Mountain wines. 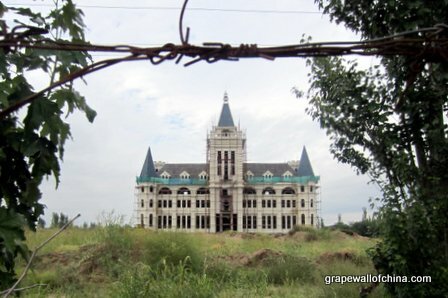 The yet-to-be-finished chateau of St. Louis Ding as seen through barbed wire. Robinson spotted it as we drove between vineyards and then pulled out a booklet she received the day before and flipped through to an image of the building on a wine promo, thereby revealing its identify. Some memory! Robinson gets a briefing at COFCO’s 1500-hectare operation, where the main facilities are scheduled to be finished in 2013. The Helan Mountains are in the background and the fields, most of them still to be planted, extend hundreds of meters to the left and back. COFCO owns or is involved in the brands Great Wall, Chateau SunGod and Chateau Junding. We’re seeing some interest in Chinese wines from abroad although it is still early days. Most often, people want to get the “top brands”, such as Grace Vineyard, Silver Heights or Helan Qing Xue, and those are produced in fairly small amounts. Waitrose in London recently introduced a Chinese wine for under 10 pounds and Dragon’s Hollow, a wine made with Ningxia grapes, is available in the US, with the entry below USD10 I believe.